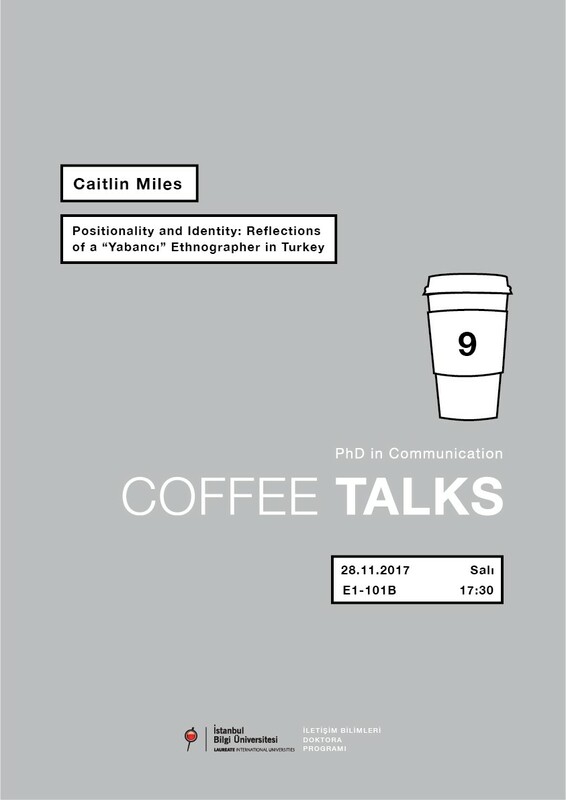 You are cordially invited to the ninth meeting of Coffee Talks, a series of events which has been carried out by BİLGİ PhD in Communication. The event will be held on santralistanbul Campus (E1 Building, Room 101-B) on Tuesday, November 28. It will start at 5.30 pm. ABSTRACT: Anthropologists such as Abu-Lughod (1996) and Narayan (1993) have argued that ethnographic fieldwork challenges static notions of identity. For example, Narayan (1993) writes “…a person may have many strands of identification available, strands that may be tugged into the open or stuffed out of sight” (p. 673). Thus, identities may be rendered apparent, irrelevant, or forced depending on the “context and the prevailing vectors of power” (p. 676). Within fieldwork, this necessitates critical reflection as to how our personal histories and environments come to bear on the stories we hear and relationship we form in the field. Moreover, it merits pondering how the lives of our interlocutors affect us and the ways we ask and explore questions. Bearing in mind the fluidity of identity, I reflect on what it means to be a “yabanci” ethnographer in Turkey. I ponder how my history as an expatriate in Istanbul, ascribed [W]estern identity, and gender intersect with my research on journalism and journalistic practice in contemporary Turkey. Rather than provide answers to the epistemological dilemmas of such dichotomies as “insider/outsider”, “western/non-western”, “modern/traditional”, I hope to facilitate an open conversation of what it means to conduct ethnography in “foreign” contexts, particularly given the political and social stakes of our current era. BIO: Caitlin is a PhD candidate in Media, Culture, and Identity at Texas A&M University. Utilizing ethnographic methodologies, she is interested in the daily experiences and practices of journalists in Turkey. Caitlin is the recipient of a William J. Fulbright Fellowship for the 2017-2018 academic year. During her Fulbright tenure, she will be conducting research in Istanbul, Turkey, where she previously lived and studied. In Istanbul, Caitlin will be working closely with different journalists and activists to better understand how personal experiences of political violence and uncertainty affect news-making practices. Caitlin hopes that this extended research endeavor will allow for a better understanding of the mutually constitutive relationship between media practice, politics, and daily life.